Want to connect with Liza? My name is Liza and I am a 33 year old mama to my super cool 16 month old daughter, Violet. 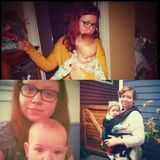 I am currently a nanny for another 16 month old in Ladner, and I am looking to add a day or two to my nanny schedule. I live in Tsawwassen and own a car. Ideally, I would like to do 1 full day or two half days on Monday and/or Friday. I am flexible on the length of the shift, especially if the arrangement is accommodating to me bringing my daughter along. I can also be available for casual weekend /evening care. Wage is entirely negotiable according to our arrangement. My home is also a safe, fun, and welcoming place for little ones and my rate is further negotiable when your child joins myself and my daughter at home. About me: I LOVE being a mama, every single moment. I am hoping to expand on my childcare experience and eventually combine it with my education and experience in local food systems. I would like to run a program connecting kids with farming/gardening, food awareness, cooking, nature, and music. Before my current nanny position, I was a nanny to a 7 month old boy and prior to that had mostly done "odd job" babysitting over the past 20 years, but have had a few consistent positions with kids ranging from 5 months to 10 years old. I am also a former Red Cross Babysitting course instructor and have Standard First Aid with CPR. I love music, painting, hiking, gardening, cooking, reading, swimming, sewing, and crafting; all things I would love to share with kids! Please send me a message for more details. I am happy to answer any questions.